We’ve all heard the old assertion that no two snowflakes are alike. But is this statement really accurate? Since we haven’t seen every single snowflake, how can we know whether any two can be the same? Joe Hanson of PBS Digital Studio’s ” It’s Okay To Be Smart“has the answer. Snowflakes are formed from frozen water during extremely cold weather (it has to be colder than 23 degrees Fahrenheit or -5 Celsius). The initial formation of the flakes takes place tn the atmosphere, where water mixes with dust particles to create ice crystals. As the crystals fall to the ground, more water freezes to the initial ice crystals, filling in the spaces available to make the characteristic six sided snowflake. The shape of the snowflake (and the pattern) depends on the atmosphere conditions that the flake encounters as it falls (things like temperature and humidity). 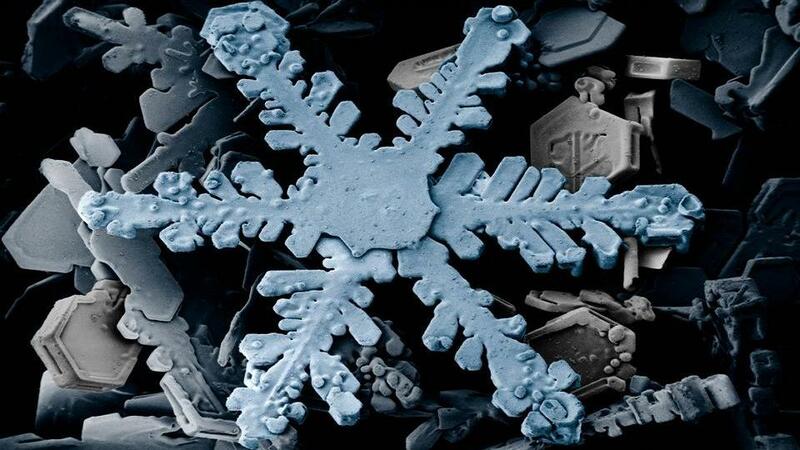 As you may be aware, the ice crystals that make up snowflakes are symmetrical (patterned). This is because the ice crystals that form reflect the internal order of the water molecules as they arrange themselves in predetermined spaces (known as “crystallization”).